Page last updated on: Sunday, 24 February, 2019. 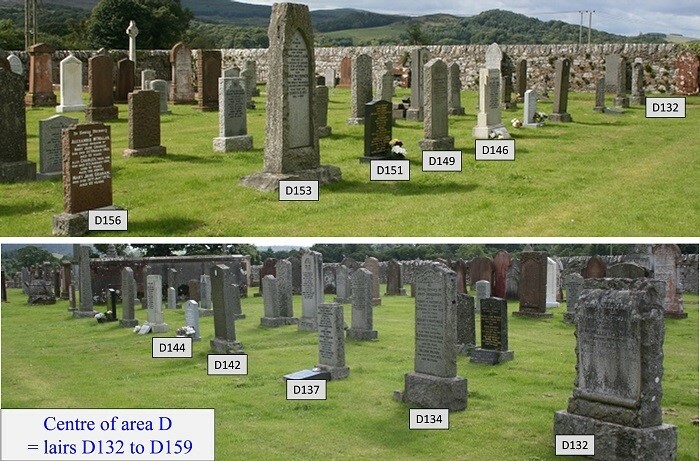 Our web-page "Girthon Parish Transcriptions" contains details of all burials and gravestone transcriptions of which we are aware. 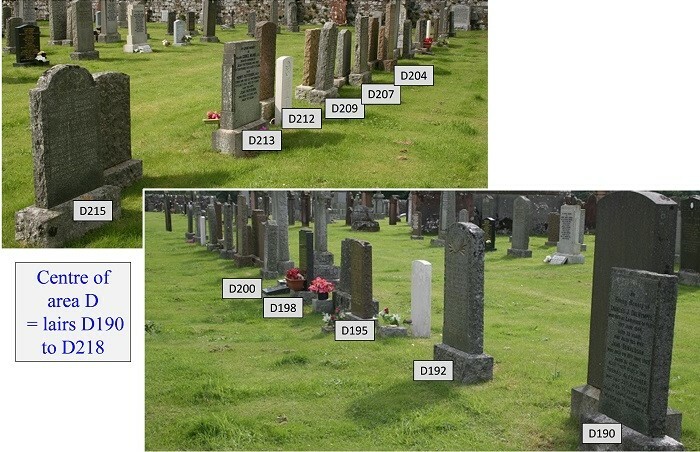 If, having looked at that searchable text page you find a gravestone that you would like to see, then come to this page and search for the relevant grave reference, then open the relevant .pdf file. Note that the surname associated with each lair is often that of the grave owner, which in some cases differs from the name(s) on the headstone. 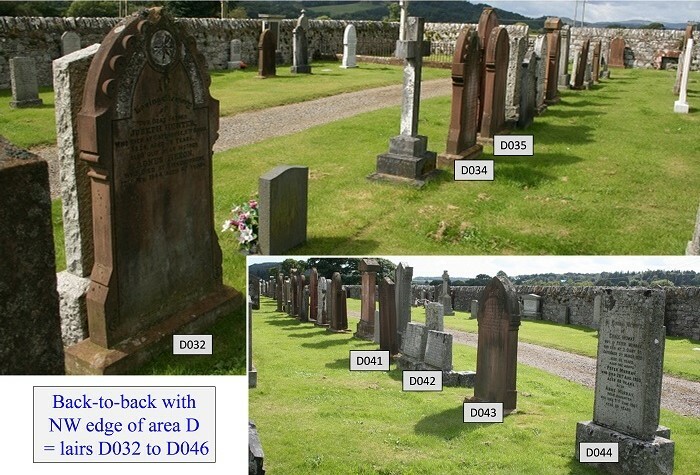 ***** Remember to use your browser's "Back" button after viewing the .pdf of a gravestone. (otherwise you will close your internet session). 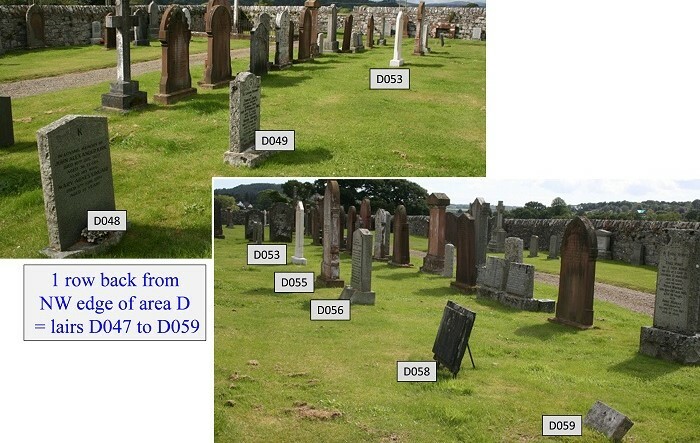 Over the years since this graveyard was first opened, the Parish Church has kept records of who owns which plot, or lair, and who has already been interred there. The Dumfries and Galloway Regional Council now have responsibility for maintaining these records which are comprehensive but not complete due either to damage or misplacement. It appears that each "plot" of ground has been sold as a "lair". This entitles the owner to bury 2 coffins - one at a depth of 6 feet, and the other at 4'6", leaving a soil covering layer of about 3 feet. In modern times this covering layer can be used for burial of caskets that result from cremation. In the early days lairs were usually sold in blocks of 3, but shortage of space has resulted in fewer lairs being purchased as multiples. As a result of the above there could be lairs that have not been filled to capacity. 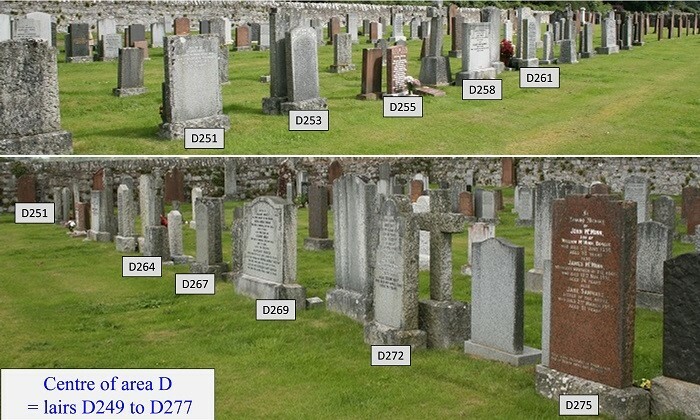 When we first photographed and transcribed these gravestones in 2007 we made our own plan of the graveyard and used our own numbering system. In 2016 we acquired the lair records and we have now adopted the same numbering system. People may have already downloaded records from our website using our old numbering, so the transcription text file refers to both sets of numbers. 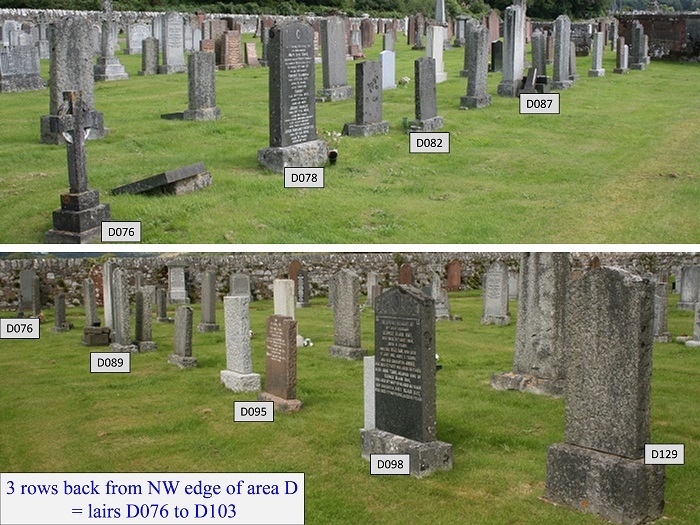 An overview of Girthon Graveyard from Memory Lane. These 2 views are from the entrance gateway. 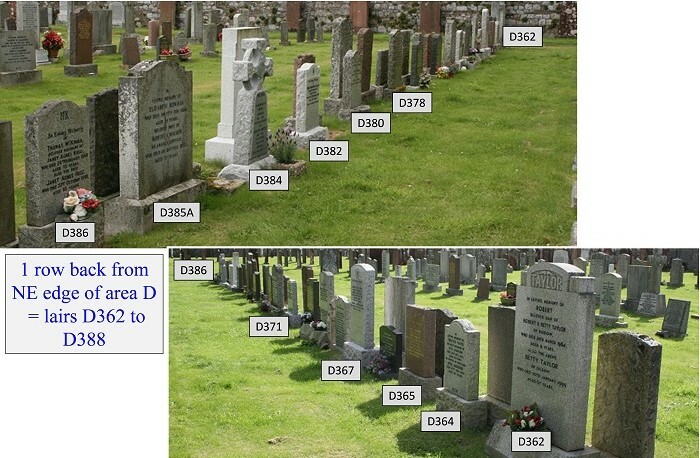 Graves are numbered starting with those adjacent to the perimeter wall; these are referred to as section A. 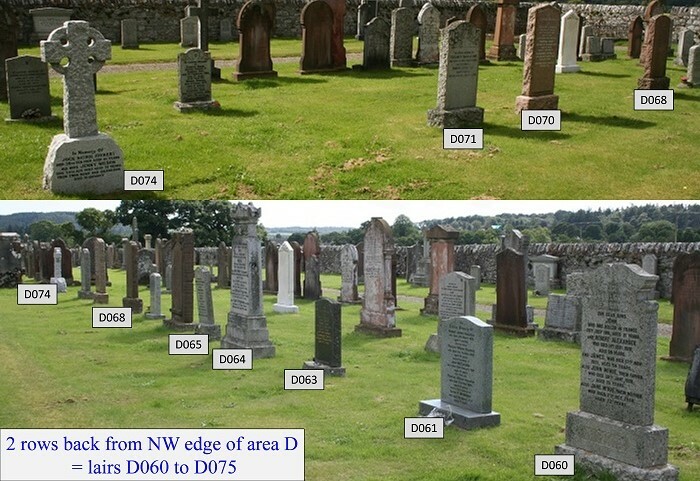 The inner area is divided into 3 sections B, C & D. Areas between sections B & C were originally used for access, but as the graveyard filled these areas were used and referred to as section E. The new extension to the NE has a separate but adjoining walled area. Here is the Graveyard Plan [there are 2 pages]. 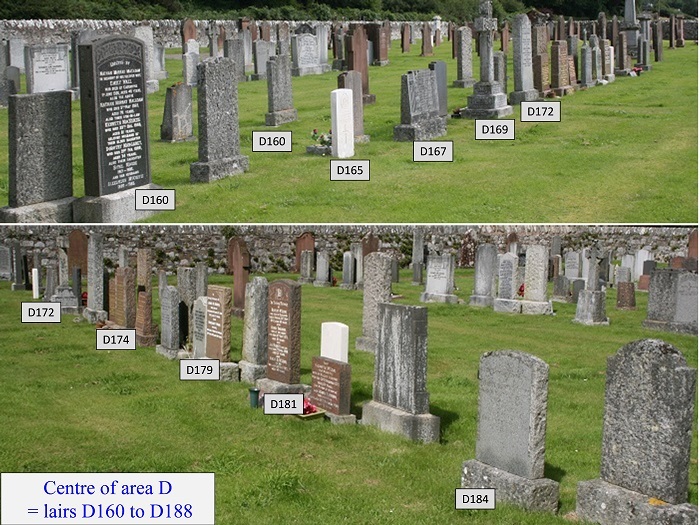 There are 5 sections in the older graveyard area, lettered A to E.
Check the graveyard plan, and note that section B occupies the SE one third of the infield area. 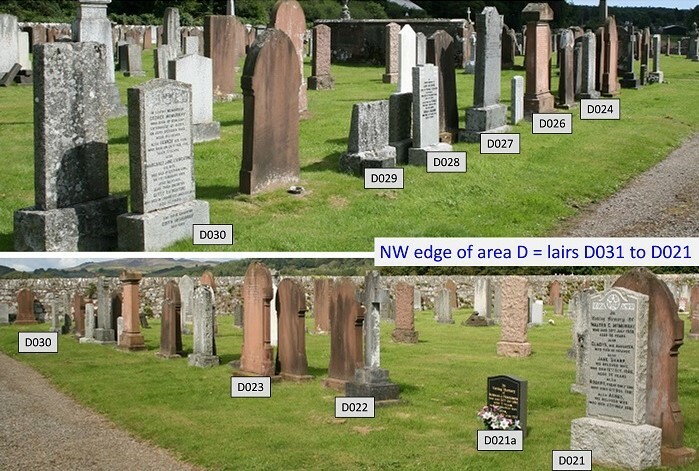 These photos follow increasing lair numbers from NE to SW. Lairs B1 to B77 are particularly sparsely represented by gravestones. The first 4 rows of lairs all face the NE wall, (i.e. lairs B1 to B36). The above photo attempts to show that rows 4 & 5 are back-to-back, as are rows 6 & 7 and rows 8 & 9. This completes the first half of section B. 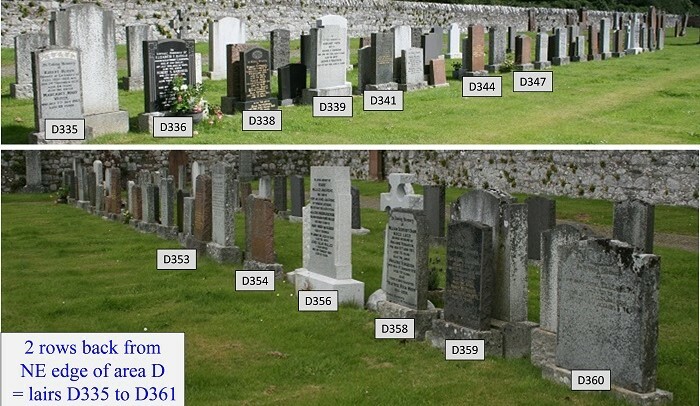 The 5th row (lairs B37 to B45) is back-to-back with the 4th row (lairs B28 to B36), and there is only 1 gravestone in this row = B45 Maxwell. Row 9 (lairs 71 to 77). Rows EC & ED are part of Section E, which is a later addition and follows Section D on this web page. 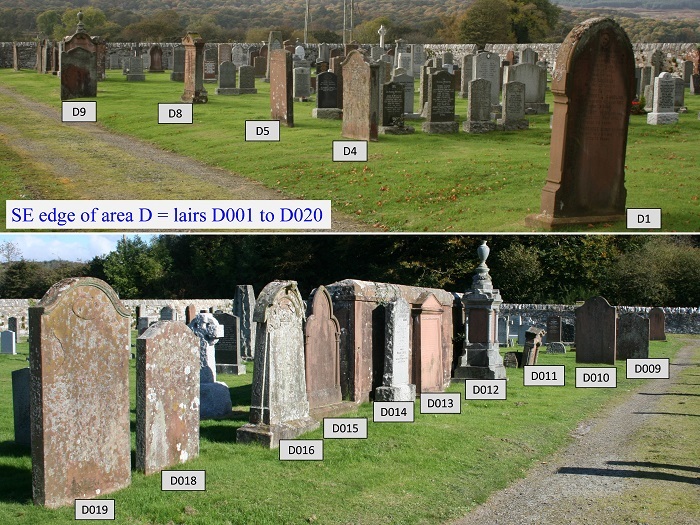 At the end of row 10 (lairs B78 to B84) is part of the old access area E. In this area lairs EB1 to EB3 are in line with row 10 but face the opposite direction (SE), whilst lairs EC1 to EC5 are back-to-back with ED-- to ED--. 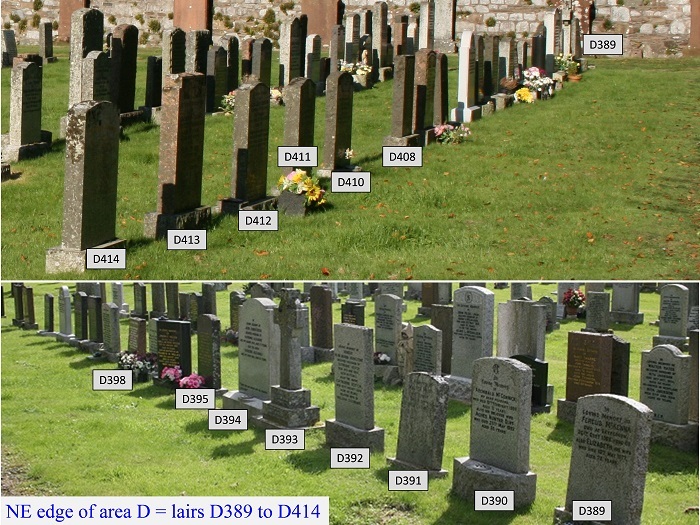 Note : In the above photograph, lairs B111 to B119 are in a line back-to-back with lairs B102 to B110. 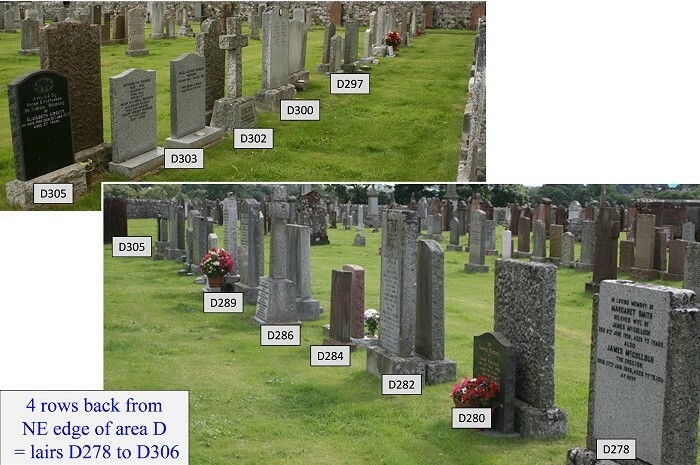 Note : In the above photograph, lairs B139 to B147 are in a line back-to-back with lairs B129 to B138. Check the Graveyard Plan, and note that section C occupies the central one third of the infield area. These photos follow increasing lair numbers from SW to NE. 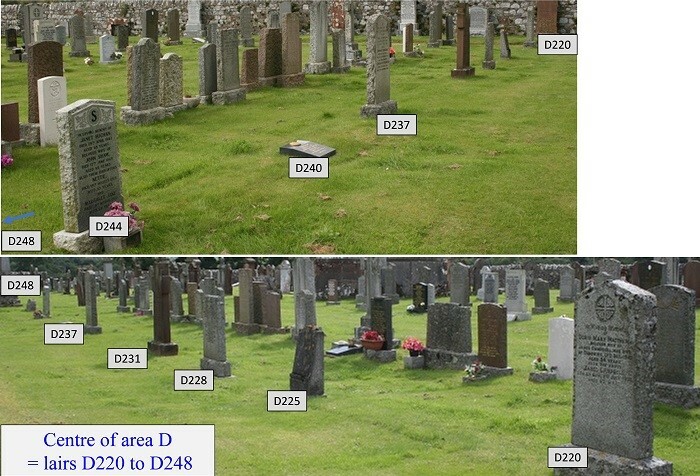 Check the Graveyard Plan to see how rows are arranged in this section. 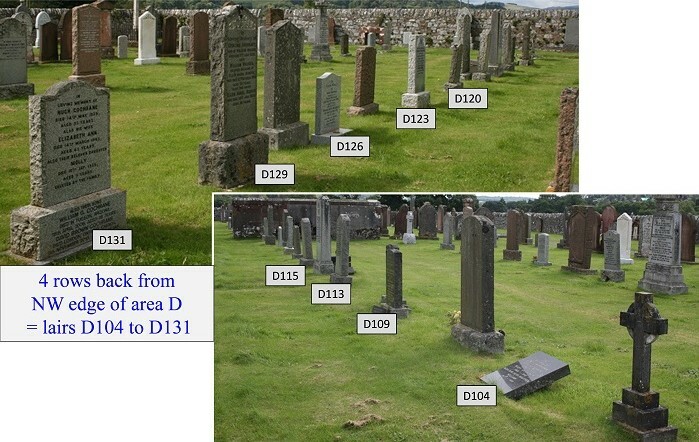 Row ED runs down the middle of sections B & C. Lairs ED53 to ED25 are within the area occupied by section B, whilst ED24 to ED1 are within section C. There is no gravestone for lair ED53, but the following shows Row ED within the area of section B. There are 2 short rows of lairs on either side of the middle of Row ED. This was probably part of a turning area for access vehicles. These 4 short rows straddle the gap between sections B & C, and encroach slightly into these sections. 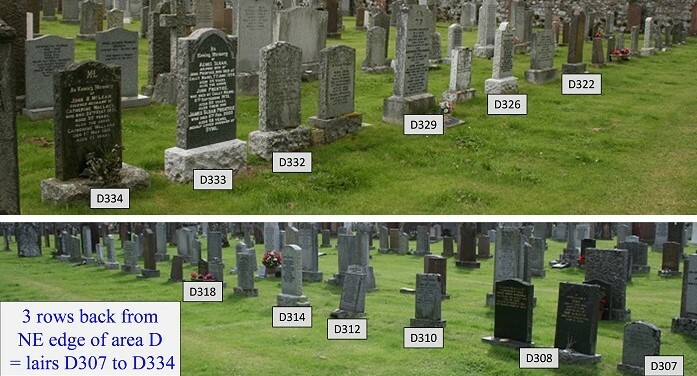 For more recent graves see the next web page "Girthon Photos Overflow"